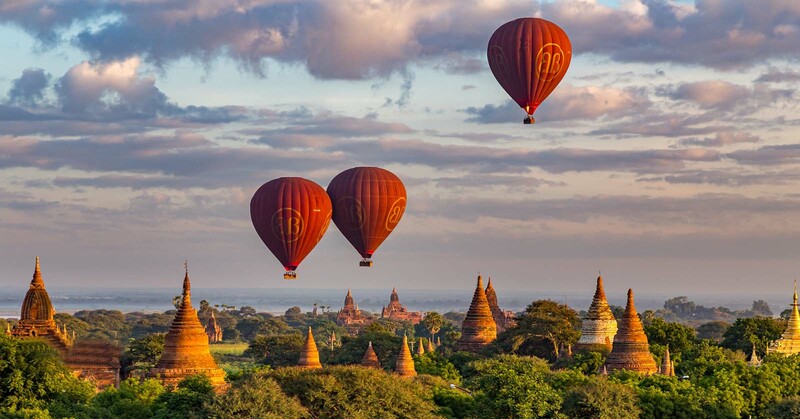 With this 12 day tour, you will discover the most major places in Myanmar. Learn more about tradition and enjoy a great journey, marvelous sightseeing at majestic landscape of a country formerly named Burma. Mandalay city tour. Visit Amarapura, a former capital of Myanmar, it’s now a township of Mandalay. First place to visit is Mahagandayon monastery, U Bein bridge, Bagaya Monastery. Continue your visit at a tradition hand-weaving silk workshop. Afternoon, sightseeing includes Mahamuni Pagoda, Shwe Inbin Monastery, the Old Palace grounds and Shwenandaw Monastery. Enjoy senery sunset from Mandalay Hill. Today, we visit Mingun and Inwa. Start the tour with a cruise on Ayeyarwaddy River. The first to visit is the beautiful white Hsinbyume Pagoda. Lunch at a local restaurant. Afternoon, boat trip to Inwa, Myanmar’s most famous old capital. These places to visit: Nanmyint Watch Tower, Maha Aung Mye Bonzan monastery, Bagaya Monastery, Yadana Hsimi Pagoda, Inwa Bridge. Proceed to Sagaing. Visit U Min Thonze and Soon Oo Pon Nya Shin Pagoda. Enjoy sunset scenery form Sagaing Hill. Return to Mandalay for dinner. After breakfast at hotel, your leisure time in Heho. Take a boat trip to jetty. Transfer to airport for flight to Yangon. Arrival in Yangon, transfer to hotel. Rest of the day is your own time in Yangon. Morning, breakfast at hotel. Spend your leisure time in the city until we transfer you to airport for your departure flight home. DAY 1: Yangon – Arrival. Arrival in Yangon. Our driver welcomes you at airport and transfer you to hotel. Rest of the day is your leisure time. Morning, enjoy breakfast at hotel. After breakfast, we start the tour by visiting the old colonial-style city center and the gilt Sule Pagoda. We then have a sightseeing along the strand road and visit Botataung Jetty. Strand Road is a major road in downtown Yangon, Burma. It crosses the city in a west-east direction and runs parallel to the Yangon River. It contains many important government buildings, including the Ministry of Trade building, court and the British embassy. It also contains the 5-star hotel, Strand Hotel, built in 1901. Afternoon, we visit Chaukhtatgyi Pagoda. Chaukhtatgyi Buddha Temple is the most well-known Buddhist temple in Bahan Township of Yangon. It houses one of the most revered reclining Buddha images in the country. We then stop at the Royal lake. Take your time to see the Karaweik Hall Royal and have some photo shots. Finally, we visit the world famous Shwedagon Pagoda. Witness the golden dome light up sunshine at the sunset. The Shwedagon Pagoda, officially named Shwedagon Zedi Daw and also known as the Great Dagon Pagoda and the Golden Pagoda. 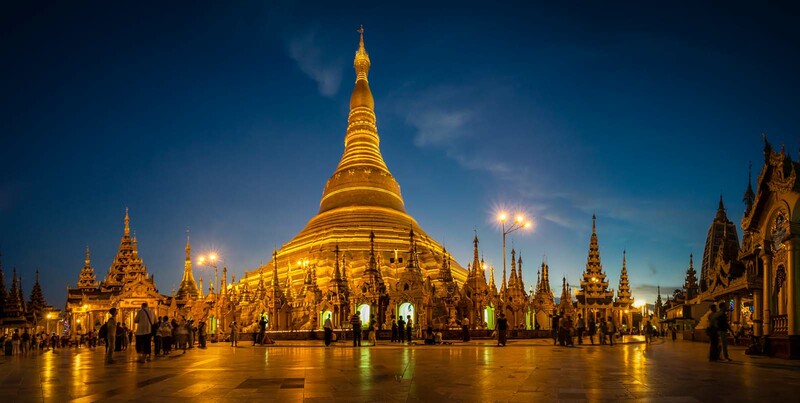 No visit to the Union of Myanmar is complete without a visit to the 2,500 years old Shwedagon Pagoda, which enshrines strands of Buddha’s hair and other holy relics. Located west of the Royal Lake on 114 -acre Singuttara Hill in Yangon, Shwedagon Pagoda is the most sacred and impressive Buddhist site for the people of the Union of Myanmar. From a humble beginning of 8.2 meters, the Shwedagon Pagoda today stands close to 110 meters. Shwedagon Pagoda is covered with hundreds of gold plates and the top of the stupa is encrusted with 4531 diamonds; the largest of which is a 72 carat diamond. It is clearly one of the wonders of the religious world. Shwedagon Pagoda is a repository of the best in Myanmar heritage – architecture, sculpture and arts. The Shwedagon Pagoda consists hundreds colorful temples, stupas, and statues that reflects the architectural era spanning almost a 2,500 years. This is the finish of our city tour. Our guide and driver take you back to hotel. Spend the night on your own. After breakfast, transfer to the Nayung U jetty to take a boat trip to Mandalay. On the way, you can enjoy and observe the way of local life along the Ayeyarwaddy River. Late afternoon, arrive at Mandalay jetty, transfer to hotel. After breakfast at hotel, we visit Amarapura. Myanmar’s penultimate royal capital, Amarapura means ‘City of Immortality’, though its period of prominence lasted less than 70 years (from 1783). In 1857 King Mindon began dismantling most of the palace buildings, shipping them 7 miles north to Mandalay, which was to become the new capital according to a Buddhist prophecy. These days leafy Amarapura is essentially a spread-out suburb of Mandalay, attractively set on a wide, shallow lake, named for an ogre who supposedly came looking for the Buddha here. The first place to visit is Mahagandayon Monastery. It is a school for young monks and observe the lunch process in morning. we then visit U Bein Bridge which is more than two centuries old and at 1.2 km longest teakwood span in the world. On the way, we stop at a tradition hand-weaving silk workshop. Afternoon, we continue our tour at Mahamuni Pagoda. Kuthodaw Pagoda is a Buddhist stupa that contains the world’s largest book. It lies at the foot of Mandalay Hill and was built during the reign of King Mindon. Surrounding the pagoda are 729 shrines each containing a single marble slab inscribed in both sides in Burmese script. Together, the 729 slabs are called “the world’s largest book”, each stone slab representing one of its pages. The slabs are inscribed with texts of the Sutta Pitaka, the Vinaya Pitaka and Abhidhamma Pitaka, the three parts that make up the Tripitaka, the teachings of the Buddha written in ancient Pali language. Proceed our visit at Shwenandaw Monastery. The Shwenandaw monastery is the most significant of Mandalay’s historic buildings, since this ‘Golden Palace Monastery’ remains the sole major survivor of the former wooden Royal Palace built by King Mindon in the mid-nineteenth century. It observes the finest Myanmar wooden architecture. Our next visit is at Atumashi Monastery. The Atumashi Monastery was previously known as Maha Atulawaiyan Kyaungdawgyi. This Buddhist monastery was built by King Mindon in 1857 after Mandalay was chosen as the capital city. The construction of the monastery cost as much as 500,000 rupees (~7800 USD) in those days. Enjoy sunset senery at Mandalay Hill. It is definitely one of the best spots in town, and the Sutaungpyei Pagoda at its top is a beautiful place of peace at sunset. After breakfast, transfer to jetty to take a private chartered boat for a cruise over the Ayeyarwaddy River, towards the former capital of Mingun. After a 45-minute cruise, arrive in Mingun which is famous for its huge unfinished pagoda and also is home to the Mingun Bell. The bell is considered as the world’s largest uncracked ringing bell. The first to visit is the beautiful white Hsinbyume Pagoda. The Hsinbyume Pagoda is a beautiful all white structure on the banks of the Irrawaddy river just North of Mandalay. The pagoda that is also known as the Mya Theindan Pagoda is located in the Northern part of Mingun town a few hundred meters from the massive Mingun Pagoda. Afternoon, boat trip to visit Inwa (formerly Ava), it is located on an island between Ayeyarwaddy and Myitnge Rivers. Along with Mandalay, Inwa (or Ava as it was previously known) is perhaps Myanmar’s most famous old capital, and is situated 20 kilometres south of Mandalay. The heart of government and royal poweron five separate occasions from the 14th to the 19th centuries, Inwa was finally abandoned in 1839 after a series of devastating earthquakes. Nanmyint Watch Tower, a square campanile of fine masonary. This is the only monument of palace buildings at ancient Inn-wa. The top most of that tower could be accessed through the three steps of stair. It is, still, the major visiting site. Maha Aung Mye Bonzan monastery, well known as Me Nu Oak-Kyaung (Brick Monastery). The Maha Aung Mye Bonzan Monastery is a fine example of Burmese monastery architecture during the Konbaung dynasty. The monastery, also known as the Brick Monastery is a well preserved building in ochre color. The very ornate structure is decorated with intricate stuccoed sculptures. Bagaya Monastery, built during the reign of King Hsinbyushin from 1763-1776. Also known as the Maha Waiyan Bontha Bagaya Monastery, the Bagaya Monastery serves as the one of the main tourist attractions in Myanmar. Maha Thiri Zeya Thinkhaya who was the town officer of Magwe built it during King Hsinbyushin’s reign in the monastic establishment and had dedicated the same to Shin Dhammabhinanda. Inwa Bridge spanning the Ayeyarwaddy River. Inwa bridge is the longest bridge of Myanmar. We then proceed to Sagaing, the hilltops, each crested with a pagoda, the banners proclaiming the Buddha’s teaching, the refuge from all ills and tribulations where over 600 monasteries for monks and nuns are located for Buddhist studies and mediation. A crest of green hills studded with white and gold pagodas marks the ‘skyline’ of Saigang, a religious pilgrimage centre that resembles Bagan with elevation. This pretty, friendly town is a major monastic centre and a somewhat serene escape from Mandalay’s constant thrum. No individual pagoda stands out as a particular must-see, but taken together the whole scene is enthralling. A highlight is walking the sometimes-steep covered stairways that lead past monasteries and nunneries to viewpoints from which you can survey the river and an undulating landscape of emerald hills and stupas. Proceed to U Min Thonze which pagoda has many Buddha images in a shaped colonnade. U Min Thonze Pagoda is one of the most distinctive complexes on the main hill top of Sagaing. “U Min” means “caves” and “Thonze” means “thirty”. The last pagoda we visit to day is the Soon Oo Pon Nya Shin Pagoda. It lies atop Nga-pha Hill. one of the 37 hilltops of Sagaing Hills. The hill resembles a frog and hence it was known as Nga-Pha Hill. It was built in 674 by a Sage U Ponnya of Pintaya Tazeeshin Thihathu. It enshrined Buddha relics revered by successive kings. Before ending the tour, enjoy sunset scenery form Sagaing Hill. You will have a panoramic sight of numerous Pagodas and Monasteries. Return to Mandalay for dinner and stay. After breakfast at hotel, we transfer you to Mandalay airport for flight to Heho. Upon arrival at Heho, our driver transfers you straight to Pindaya. After breakfast, enjoy a little time at leisure until a boats take you back to jetty. Car transfer to airport for flight to Yangon. Arival in Yangon, transfer to hotel for check-in. Rest of the day is your leisure time to explore the city on your own. Breakfast at the hotel, we start overland drive to Twante (1:30 hrs driving, Coach as an option). Agriculture and Fisheries are the main business for local people. Local products such as bamboo, rattans, bamboo-trays, sieves, and bamboo-chairs are also produced there. As pottery is one of their traditional industries, you can see many potters’ workshops. Then visit to home industry of looms, as weaving. After that, we continue our visit at Shwe Sandaw pagoda, Baung Daw Gyoke Pagoda. Enjoy lunch at a local restaurant. After lunch, we visit to local market and observing at the fruit and vegetables lay out in baskets on the ground, dried fish, and tethered poultry. We drive back to Yangon .